This simple tool helps to get rid of useless CSS and JS files, added to your website by poorly optimized themes and plugins. With the assets manager, you can set up custom conditions for loading resources, so all plugins, themes and WordPress scripts and styles will be loaded for the pages, where they are really needed. Using this tool for your website optimization will help you to reduce the number of HTTP requests and the weight of pages. Our plugin doesn’t remove resource files from your hosting (server). It simply disables the files automatically. This is a completely safe tool to speed up your website. Even if you accidentally break something in the interface or damage a slider/ a form performance, your users wouldn’t even notice it, as the plugin supports the safe mode. And if you choose to disable the plugin or reset its configuration, all effects caused by the plugin will disappear. Plugin has a beautiful and user-friendly interface with intuitive tooltips for each option and category. What’s the difference between this plugin and other optimization tools? Our tool can work together with other optimization plugins and improve your optimization results at the same time. Combine the files to minimize the size of the HTML, JS, and CSS code, and reduce the number of HTTP requests. Pages are lighter and faster. These plugins don’t disable unwanted scripts & styles! Store the page copy and open it instead of the newly generated page. Your server doesn’t waste extra resources on the page generation. 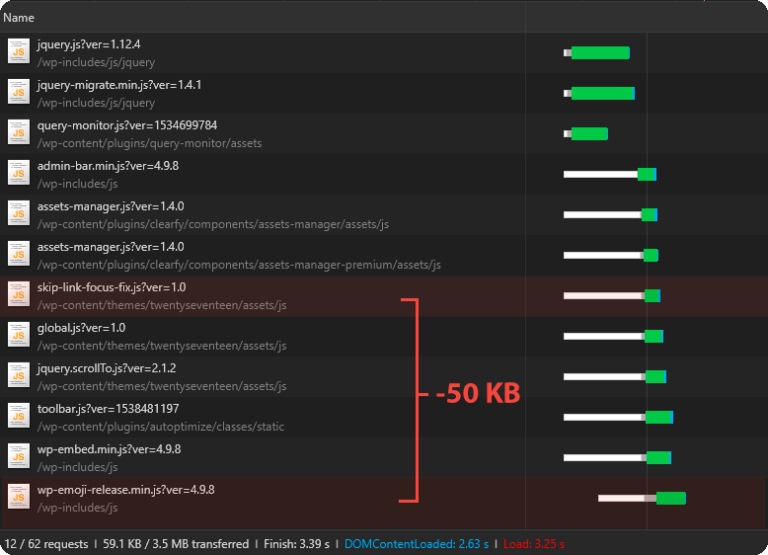 This Assets manager is not a copy of other popular performance optimization plugins for WordPress. So what’s the difference between this plugin and other optimization tools? Our plugin 100% removes all unwanted scripts & styles from the HTML code instead of masking them. Other tools don’t remove scripts & styles. They just reduce the weight of the files and combine them in the one. So if you use caching and minify plugins all unwanted scripts & styles are still loading and slowing your website performance. Disable several resources using our plugin and see the difference in optimization figures. Our plugin supports other popular optimization plugins, including Autoptimize, Cache Enabler, W3 Total Cache, WP Super Cache and WP Rocket, and can work together with them, improving your website performance. It is pretty simple and user-friendly even for inexperienced users. Just follow 3 steps and optimize the website in no time. The plugin will analyze scripts loaded on the current page and summarize the details of usage. Select all necessary JS, CSS files or plugins. Don’t forget to check the resource details. Specify pages where the certain files or plugins should be disabled. Save the settings. Optimization is done! Disable individual JS and CSS files. Set up conditions to disable resources on the current page. Disables resources on all pages, except page types selected by the user. If you use Autoptimize then you can easily exclude all scripts from this plugin’s optimization. If you use Clearfy then you can easily exclude scripts from optimization. You can also exclude scripts where the request string removal is not necessary. Disable all JS, CSS files of the selected plugins. Disable resources on pages with the matching regular expression URL. Once you use the safe mode, the users wouldn’t notice any changes in the frontend of the website. You can view optimization results, the list of disabled resources and the total weight of JS, CSS files.